Investors cheered news that Chinese GDP grew 6.4% year-on-year, ahead of expectations for growth of 6.3%. Industrial Production meanwhile grew at a more impressive 8.5% year-on-year, ahead of expectations for growth of 5.6%. The China-focussed Australian Dollar and New Zealand Dollar were unsurprisingly the default winners of the news, and we are seeing the GBP/AUD and GBP/NZD exchange rates down a third of a percent as a result. But, the Euro is also displaying a positive correlation with Chinese sentiment and is also trading higher. "If the AUD breaks out to the upside, the EUR is not far behind. This rule really does work a little more than half the time," says Barbara Rockefeller of Rockefeller Treasury Services. The Euro-to-Pound exchange rate is seen trading a quarter of a percent higher at 0.8668, giving a Pound-to-Euro conversion of 1.1536. The Euro-to-Dollar exchange rate is a third of a percent higher at 1.1319. Why does China matter for the Euro all of a sudden? The answer lies with expectations that Eurozone exports are likely to recover over coming weeks and months, driven by a Chinese-inspired pickup in global trade. Eurozone exports - notably those coming out of Germany - had fallen sharply in the second half of 2018, leading to a slowdown in overall Eurozone economic performance. This in turn prompted the European Central Bank to adopt a more cautious approach to the matter of raising interest rates, which in turn weighed on the Euro's outlook. There were multiple reasons for Germany's slump in exports that include reduced demand out of the UK, low water levels on Germany's Rhine river and a sharp drop in demand for Eurozone goods from Turkey which is undergoing a an economic crisis. But a large fall in overall global demand was also blamed, and this is in turn largely linked to a slowing in China's economy. "The demise of the Euro in 2018, and in particular since September when EUR/USD was trading at 1.1800 was in large part down to the worsening global growth outlook that had coincided with evidence of worsening economic conditions in China," says Derek Halpenny, a foreign exchange strategist with MUFG in London. Above: Chinese growth is still rising at a clip compared to the rest of the world, but there is a sense growth rates are stabilising at lower levels. Therefore, recent data suggesting China might have turned a corner is proving supportive of expectations for global trade which is ultimately supportive of the Eurozone's economy, and its currency. The turnaround in Chinese economic activity appears linked to efforts by authorities in the world's second-largest economy to provide stimulus to counter the slowdown. 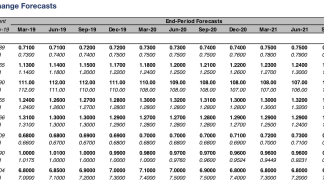 "Data released earlier today has reinforced the optimism that the stimulus measures implemented in response to the slowdown is now providing support for the economy," says Halpenny. The GDP data confirms a trend in the data that points to improving growth momentum, with strong PMI survey figures and credit data being released earlier this month. Friday, April 12 saw the country reveal exports rebounded in March having increased 14.2% year-on-year from a 20.8% fall in February. A Reuters poll had forecast growth of 7.3%. Also underpinning the improvement is, U.S. President Donald Trump’s decision to not raise tariffs in March and signs the U.S. and China are making solid progress towards striking a trade deal. "The key beneficiary of a global pick-up is going to be Germany," says Halpenny. "The ZEW Survey Expectations Index in data released yesterday revealed an increase from -3.6 to +3.1 – that was the first positive reading since March last year." Of late we have heard from a number of foreign exchange strategists who are adopting a constructive approach towards the Euro and are willing to bet the currency can go higher. 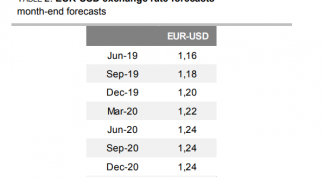 "We like buying EUR/USD this week," says Hans Redeker, a foreign exchange strategist with Morgan Stanley. 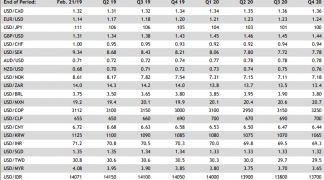 "Rebounding China data should filter through to better Eurozone data over the coming months," says Redeker, a view that appears to have been vindicated by today's numbers out of China. "Optimism on growth in the rest of the world rebounding should weaken USD and help EUR." A rising Euro-Dollar exchange rate would be expected to aid a rising Euro-Pound exchange rate. Therefore, those watching Sterling-Euro at present should also be wary of moves in EUR/USD, particularly with Brexit headlines fading into the background. The Euro is likely to be a bigger beneficiary of a nascent economic recovery in Asia than the U.S. Dollar, according to analysts at Nordea Markets, who have said for this reason that clients of the Nordic bank should consider betting on a rise in the Euro.